I was again dragged from sleep by my husband this morning, this time for an excursion to Antelope Canyon. 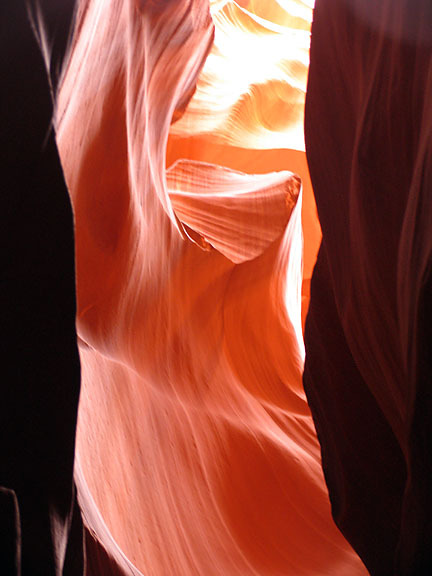 Antelope Canyon is in Arizona near Glen Canyon Dam and is on Navajo land. I was expecting to see a canyon filled with antelope, but I was told the antelope left the canyon in the 50s. The canyon is now filled with tourists, apparently mainly German, but they have not renamed it German Tourist Canyon. We arrived at the tour site as directed. It is worth noting that Arizona remains the only state that gives the proverbial finger to the rest of the United States and refuses to adopt daylight savings time. I guess they think they have enough sun and don’t need more of it. 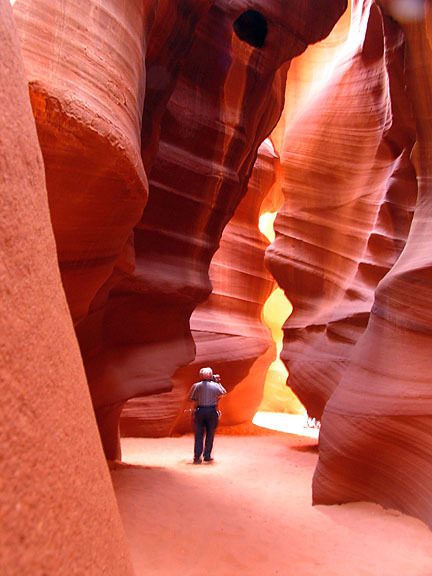 The tour site is run by Navajo who conveniently own the land on which the slot canyon is sited. If the federal government had foreseen what a cash cow this place was to become, they would have shipped the Navajo farther west. Lucky for the Navajo that our ancestors were lazy. Getting to the site was an adventure. They line you up and have you crawl in to the back of a 4 wheel drive truck with big tires, 2 long bench seats that comfortably seat 5 and then shove 6 on each side and make you share a seat belt. The back of the truck is covered with a fancy tarp. Our driver and tour guide, Angie, wasted no time hauling out of the parking lot and getting on the road. Angie could give pointers to the guys that do that crazy off road race in the deserts of North Africa. The only thing that would have made me feel less secure on the road would have been if Angie had heaved an empty bottle of Mad Dog out the window as we careened through the desert or yelled “Hey watch this”. Earl is blurry because these photos take long exposures and Earl is a perpetual motion machine of an old man. Once the tour concluded and we returned to the starting point, we attempted to tour Glen Canyon Dam, but they refused to allow us in with a camera bag. I find it odd that security will not allow white middle aged people to tour with a camera bag (or purse) in tow, but just ½ mile away on a cliff is a platform created to provide an unobstructed view (and open shot) of the dam for any terrorist with a rocket launcher. I’m just sayin’. So we drove up to Wahweap overlook and looked at the marble canyons and the water and the dam from the backside. After six days in the desert, I am beginning to feel canyon fatigue. What was new and novel is now starting to seem old hat. I feel much like I did in the museums of Europe: “Another Madonna col Bambino” by Michelangelo. Yawn.